p cubed presentations > Latest posts > science of fail > What if I told you.. I picked this up from Google search. I tweeted it and it has now been retweeted in some form or other more than 600 times. Which says an awful lot. The meme comes from the film, The Matrix. The character, Morpheus (amusingly, the god of sleep) is speaking to Thomas (soon to become Neo) about his perception of the world. He challenges Neo to consider his experiences and the possibility that these do not represent reality. Without pushing the analogy too far, although I am sorely tempted, the reality of presentations within which we believe we exist is flawed. This is our Matrix. 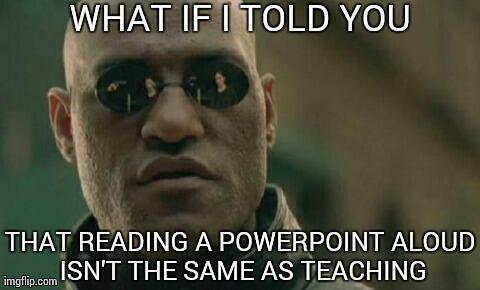 There is a belief that no “talk” can be given without recourse to a “powerpoint”; that no presentation is complete without a script on the screen for the audience to read; that information has to be presented in bulletpoints to be memorable; that education isn’t interesting or fun; that there is only one font and that by reading your powerpoint aloud, people will learn. Is that your reality? Which pill will you take?